The fastest DVD ripper that supports any newly released DVDs. Save up to 49%. Buy lifetime version & get a gift. Updates for latest DVD - Constantly upgrade to rip new DVDs. Seamless support for the latest OS and devices, such as Mojave, iPhone XS/XS Max/XR, iPad Pro, Samsung Galaxy and more. Rip protected DVD to MP4, MOV, AVI, MPEG etc for iPad, iPhone, Android devices. 1:1 copy DVD to IOS file. New video processing software designed to cut, trim, merge, adjust, transcode, edit videos with hardware acceleration. 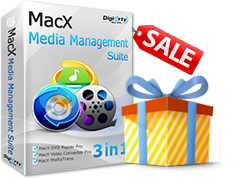 MacX MediaTrans - The easiest and most powerful iPhone/iPad manager.